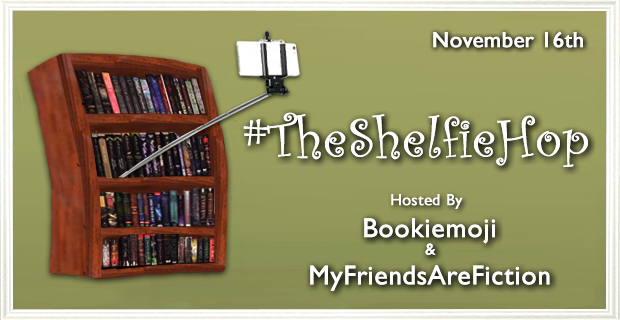 The Shelfie Hop is hosted by Bookiemoji and My Friends Are Fiction! Hey guys! This post is going to be a little different than most because it is all about my bookshelves! As you guys know, I religiously shop at BookOutlet (both online and in store!!) so my shelves are STUFFED with books, so I thought I would sign up for this blog hop to show you guys my shelves (mostly to make you guys a little jealous to be honest). I have five shelves but am only going to show you the ones I have in my bedroom. I took it upon myself to decide that I would rather have pretty shelves than all my books on shelves. However, this means that I do NOT have a shelf for all my science fiction books, so if you were hoping to see those, I'm sorry to disappoint you. They are on the floor in my spare bedroom so they will not be featured in this post. I had you guys vote on Twitter for the four shelves that you wanted me to feature and they were my Shadowhunter shelf, my Signed books shelf, my Harry Potter shelf, and my manga shelves. So I will go into depth about those, but will still be posting pictures of my complete bookshelves! I have a couple special editions of books that I will point out as I go along, but I will not be listing every book on my shelves (it would take me literally hours upon hours). If you look through the pictures and want to know what a specific book is, just ask! I will be more than happy to let you know! One last thing before we get to the pictures, I have my shelves done by genre and then by author name. You're only going to really see my fantasy shelves and my manga/mystery shelf (because my contemporary/historical fiction shelf is a DISASTER that I could not clean up before this -- and as stated above I don't technically have a Science Fiction shelf), but I have two shelves just for fantasy books so that makes it okay, right?? Okay, I'm done talking, look at pictures now. In my room, this is technically my "first" shelf. This is the start of my Fantasy books organized by author last name starting with "A" to "I". I also have my The Hunger Games Funkos on top of this shelf because, as stated before, I don't have a shelf for my Science Fiction books and I didn't want them to get ruined. I am currently missing my hardcovers of TID (which are on loan to my aunt) and I still need to pick up the new versions of TMI and a paperback of CoHF to match my others, but this is what I have here. When I went to Ottawa Comicon a couple years ago, I cosplayed as Clary (I have red hair, it was inevitable), so it is pretty safe to say I love these books. This means they deserve their own special shelf. I do have the manga for TID but since it is on my manga shelf, I figured I'd wait and show you that then! I also have a black sweater that says "Shadowhunters: Looking Better in Black Than the Widows of our Enemies"
The next shelf in my room is my actual favourite bookcase. It has Shakespeare quotes about love on it! I plan on eventually moving my contemporary novels onto this one, but for now it holds my Fantasy books from "J" to "Z". This bookcase has a lot more "feature" shelves on it than my other ones because it has a little bit more space than the other shelves I have. At the top I have all my AIR AWAKENS books and prints, the next shelf has my laminated THE GIRL FROM EVERYWHERE map, I have my THE RAVEN CYCLE books, mug, and tarot cards out nicely, and finally my colour your own CARRY ON cover! Honourable mention to my ASoIaF shelf and my WoT shelf! Both amazing series that I recommend to anyone who wants to read a solid fantasy book. Also, I have the pop-up maps of Westeros so if you want to see something cool, just ask me on Twitter and I will show you them! (Also, just throwing out there that I met Jason Momoa and he is dreamy and I love Khal Drogo). MOVING ALONG. This is my "third" shelf in my room. It sits inbetween my Fantasy "J" to "Z" shelf and my "not a bookcase but used as one." On here I have, from top to bottom, my Currently Reading/TBR shelf, my signed books shelf, my Classics shelf, my philosophy shelf (plus my Graduation Horse that I got when I graduated from University. Our mascot was a Gee-Gee [first horse out of the gate] so it is a little horse with a graduation cap on it! ), and finally my Giveaway shelf! All those books and swag is stuff that I will be giving away eventually :) A couple of them are even signed books! 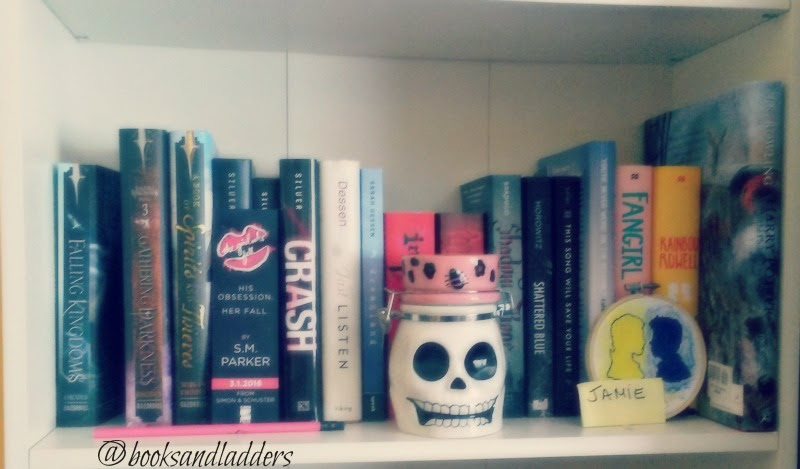 People voted to see my SIGNED BOOKS shelf! I have a collection of books that are signed and deserve to be all on one shelf. 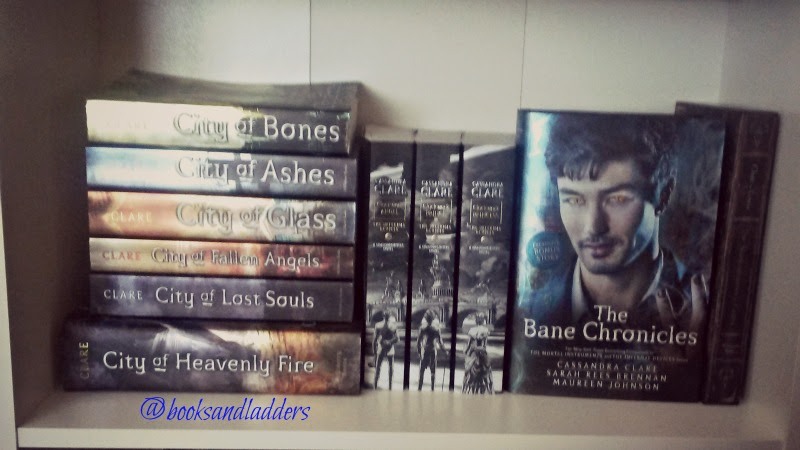 It should be noted that there are other signed books spread throughout my shelves so that I can keep them with their series, for example my signed Queen of Shadows and my signed Ungodly sit with their series instead of on this shelf. If I have a whole set signed, I kept them on this shelf. Also on this shelf is the cool skull jar my mom bought me, the post-it note I got at Fierce Reads Takes TO, and some of the swag for THE GIRL WHO FELL! NOTE THAT THE ILLUSTRATED HARRY POTTER IS NOT SIGNED, IT JUST DOESN'T FIT ANYWHERE ELSE. On the black shelf that sits next to this shelf is just my vintage books but it also has some personal pictures and stuff so I'm not featuring it on here :) But after that is my Harry Potter shelf! This stuff sits on top of my dresser and it is actually getting overstuffed. 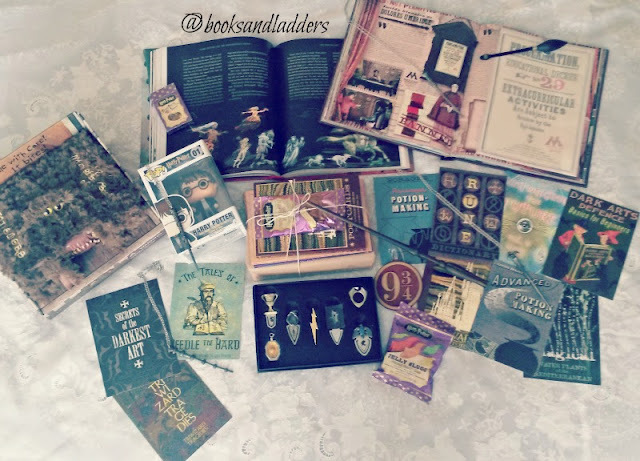 You can't really see it all here, so I took a much better picture for you guys to highlight some of my favourite stuff from my Harry Potter collection. I am SUPER lucky that in my town I have a store that sells the Harry Potter collectibles that you can get at Harry Potter World in Florida! She orders in whatever I want, typically. I have hats and scarves and bags not featured here, as well as patches for the different houses. I ALSO have a Wizard's Chess set but it takes me forever to unwrap it because it is all glass. It is wonderful though. I had a Harry Potter snow globe (because I collect those) but it broke accidentally when I was moving in university. I sobbed when I unwrapped it and it was broken. I was so sad. Onto the last shelf in my bedroom! The last shelf in my room has my Currently Reading graphic novels/single issues comics on top, using my Villains 2 and Heroes 2 LootCrate boxes as bookends! 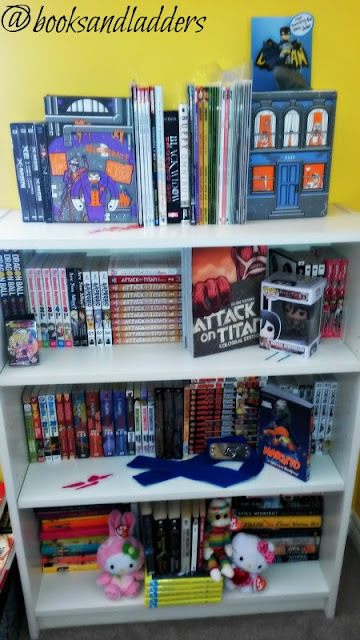 (Batman is watching over them) This bookcase features my manga and my mystery novels. I have a feeling soon this one will be strictly manga but until then I had to double up. The last shelf people voted on to see was my manga shelf over my comic collection, which I gotta say I was torn on this one. I have a huge comic collection and some are even signed by some really cool people, but I digress. I love manga and anime. I love any sort of story that uses words and pictures to tell the story (hence why I also said you guys could vote to see my comic book collection) and I love the manga art style. I am not super diverse in what I read for manga and typically read manga for the anime that I like. I have a couple others that I read online that I haven't purchased volumes for yet (because no cash money) but my absolute favourites are Attack on Titan (Shingeki no Kyojin), Pandora Hearts, and The Devil is a Part-Timer! Which of my shelves is your favourite!? Do you have some of the same books as me on your shelves? I always have a hard time choosing my favourite one. Also, don't forget about the two giveaways I have going on. One for a copy of HOW TO BE BRAVE and one for an AIR AWAKENS SWAG BAG. 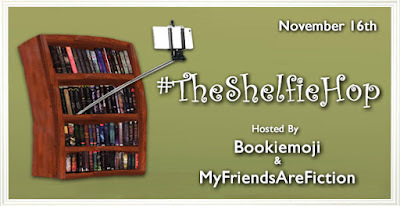 See the other blogs participating in #TheShelfieHop! Your shelves are awesome!!! I just purchased Air Awakens and that cover <3 I can't wait to read it. I cant' believe I'd not heard of it until very recently. I love how organized your are. I literally have no method to my book madness. well, I do group series together but that's it. Your shelves look sooooooo good! I can't wait to add little knick knacks and funkos to mine! I'm still in the process of adding stuff like that! Thanks for joining!! I'm so jealous of your shelves. Omg. Aw, I should've added my box of book swag to mine! Your shelves are beyond pretty! I love your City of Bones trilogy. It's so metallic and sparkly! I love your shelves and all your bookish goodness! There is so much cool stuff. 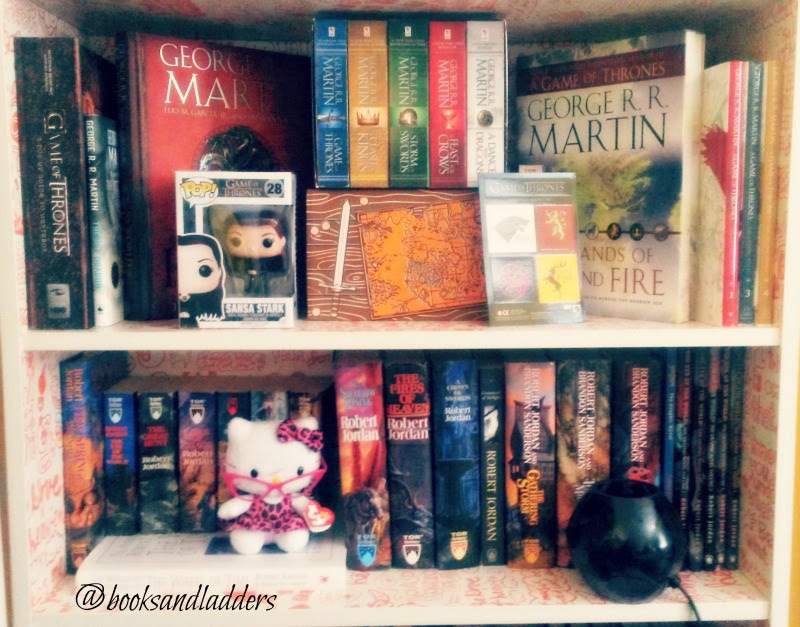 I love your Cassie Clare, ASOIAF, and Morgan Rhodes shelves!! I love seeing all the books but i think the bookish fun stuff is my fav. I also have come to the conclusion that i need to ask for another book shelf for Christmas. Your signed shelf makes me think I should make one of my own. 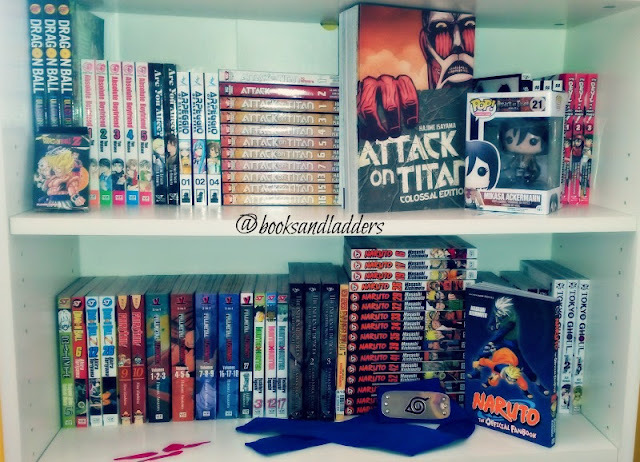 My BFF is collecting the Naruto manga too! WoT! Also known as the first series I've ever read because I was given the first book and had long stretches of nothingness at college. I love the idea of having a signed shelf, but I think I'd have to keep the books with their series or else I'd forget which ones I owned. The problems of too many books. One day I am going to read/watch Attack on Titan. Everyone keeps talking about it. I see many have the City of series by Clare. I may have to check them out since they same well loved. Plus you look very organized! 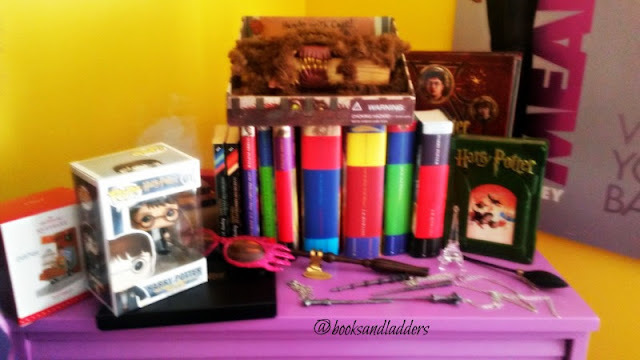 Awesome Harry Potter shelf. Your dresser too is amazing. So bright!